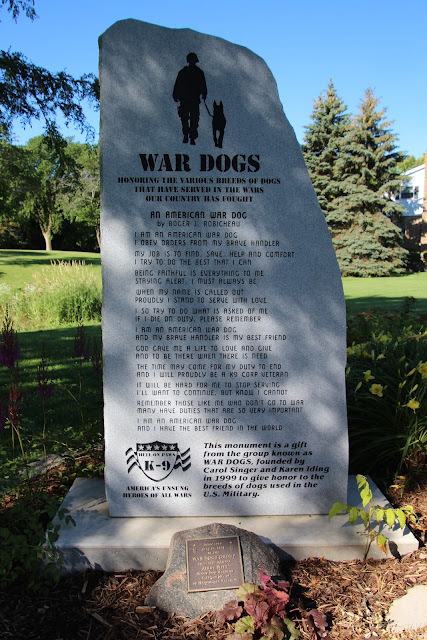 This monument is a gift from the group known as WAR DOGS, founded by Carol Singer and Karen Idlag in 1999 to give honor to the breeds of dogs used in the U.S. Military. 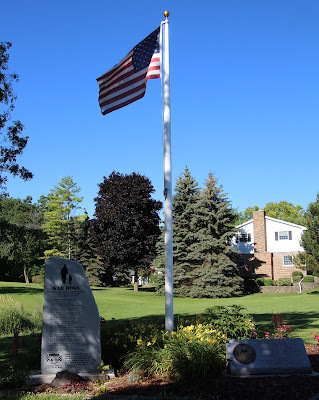 The memorial is located at the northwest section of Village Park and is accessible from eastbound Garfield Drive, between Sheridan Drive (to the west) and Mill Street (to the east), and is directly across from the North Middle School Campus, Menominee Falls, Wisconsin 53051. See also, Menomonee Falls World War II Memorial, also at this location. 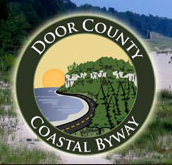 with the memorial visible in the distance between the two trees. Nearby Henrizi-Schneider Post 382 American Legion building. The memorial is located in Menomonee Falls, Wisconsin.